Supercharge your sales with the game-changing tool that allows you to uncover 1000's of local business leads in any industry or city in seconds. 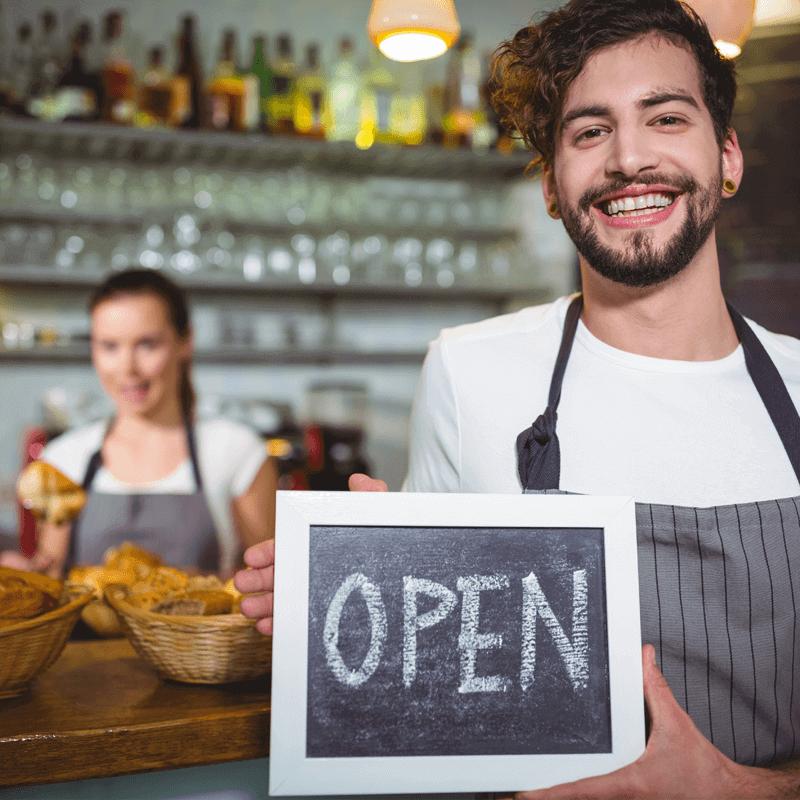 Tap into a treasure trove of local business owners in need of your products & services. Leads are the lifeblood of any successful business. With LeadsRecon, you will instantly have the ability to generate new business quickly and consistently from the largest and ever-growing source of virtually unlimited local business leads who are in need of your expertise, products or services. That's why we built LeadsRecon — To help you get leads & sales faster than ever. Get leads on demand without spending endless hours scouring the Web. 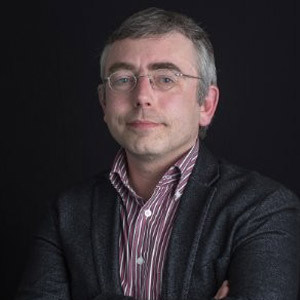 Generate new business consistently and give your income a permanent boost with an endless stream of prime local business leads at your fingertips. No more spending hours of precious time manually combing through endless business websites and painstakingly seeking out high potential leads. Tap into the largest source of over 50 million businesses active on Facebook to uncover leads in any industry, city and country on the planet. Real estate agents, dentists, florists, café owners. You name it. There are thousands of thriving local businesses in every corner of the world. 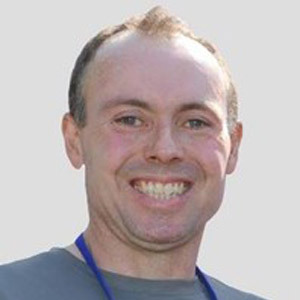 All of them are masters at their crafts but when it comes to certain other aspects of running and growing their businesses, they need your expertise and are often more than happy to pay good money for it. Whether it is in marketing services, social media, video services, website creation, SEO, bookkeeping services or business equipment, your expertise, products and services are highly sought after by many local business owners. Local business owners understand the value in dollars that your products and services can bring to their businesses. More importantly, they have the ability and willingness to pay well for this value. This means that you can easily earn 5X or even 10X more with the same amount of time and effort put in than you would when selling to someone who don't yet own a successful business. Already selling to OTHER businesses? Gain an unfair advantage instantly. Everything you need to get more sales with an endless stream of leads. LeadsRecon is built from the ground up to help you quickly discover 1000's of local business owners in any industry and city by tapping in to the largest source of local business listings worldwide, with over 50 million local businesses listed from around the world. 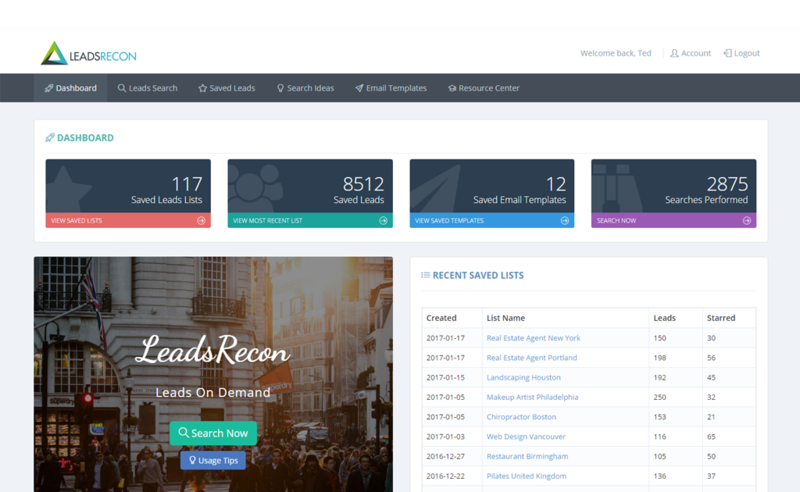 Search, analyze, filter, create lists of potential leads, craft email templates, send emails and start getting more customers and sales, all using LeadsRecon. LeadsRecon is designed to be so intuitive to use. We place great emphasis on usability and user experience so that you can get started immediately without any complicated learning. Just don't be deceived by its clean and simple interface – LeadsRecon packs a punch under its hood! Search for leads in any country, city or even district. Use the built-in website analyzer to extract all the useful information without having to scan through an entire website manually. Save leads from your search results to lists and access them anywhere, from any device. Build up large lists for prospecting campaigns, add leads to favorites or even add personal notes to leads. Supercharge your sales FAST with leads on demand. "LeadsRecon finds us leads that we'd have never thought to contact. The interface is simple and easy to use so it fits seamlessly into our business processes. 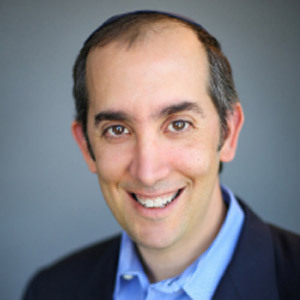 LeadsRecon does our homework for us so we can spend more time talking to potential clients." 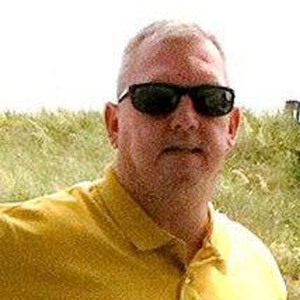 "LeadsRecon is my go-to tool for finding leads. It's quick, accurate and very simple to use. The amount of information it brings back is astounding. It saves me hours of work. Whenever we run a new campaign, the first step is always "LeadsRecon". It gives us the results we need in seconds. I highly recommend LeadsRecon." "LeadsRecon is a best-of-both-worlds in lead generation because not only do you get to search through Google listings to find businesses to contact, LeadsRecon also gives you access to business listings on Facebook. I find the interface to be super easy to use and because I can quickly create and save search results to lists that I can access later, I can start a project and come back later to finish it. If you are ADHD or just super busy, this tool has all the features you need to effectively target businesses in any industry, build your lists of contacts and then send out emails to prospects directly." 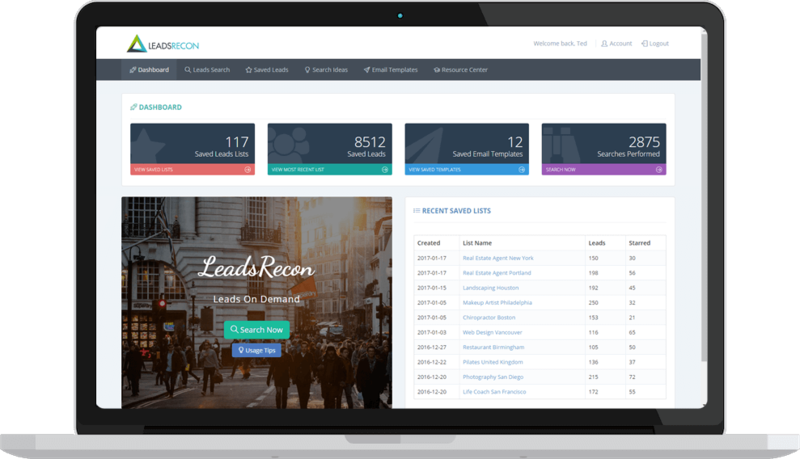 "I've used several lead generation tools in the past but LeadsRecon turned out to be the easiest and most straight-forward one to use. There's nothing to set up or configure (no apps to set up, no APIs to configure, no installations). Just log in and you are ready to start finding leads. It's that simple. The only time I had a problem, it was a very specific localization issue, and they had it fixed within an hour. This is a very easy-to-use, robust and effective lead generation tool that is here to stay where everything is always kept up-to-date and running smoothly." 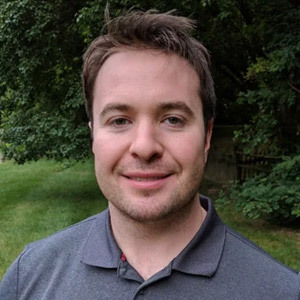 "In addition to easily finding leads in new locations for my contractor marketing business, whenever I begin a new project, I even use LeadsRecon to conduct a quick research on what my client's competitors are doing when it comes to their domain names, website structures and contents. LeadsRecon just cuts through the clutter and gives me the results I need in minutes, not to mention the support is outstanding. I am more than satisfied with LeadsRecon." "LeadsRecon is my favourite prospecting tool due to its clean and uncluttered interface, and the super-easy way to search for leads and integrate everything with your existing Gmail account. It's also cloud-based so one less application to clutter up my hard drive!" 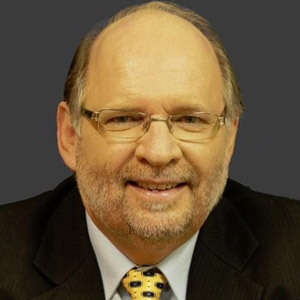 "LeadsRecon has been a wildly successful investment for my businesses. It gets useable, targetable leads for almost any niche and does so without sacrificing loads of time. It is very simple to use. I have a couple of cloud-based software tools from the creator of this tool and can confidently recommend them. Not only will they be around for the long term, they are responsive to questions. I suggest you don’t let this opportunity pass you by because there is no simpler way to get targeted leads. You won’t regret it!" 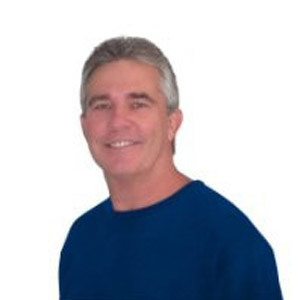 "One of the best local lead generation tools on the market. Simple to use and saves me many hours of laborious work. I'm really impressed with how fast it delivered the results. Don’t sit on the fence wondering if you should buy it — just do it!" 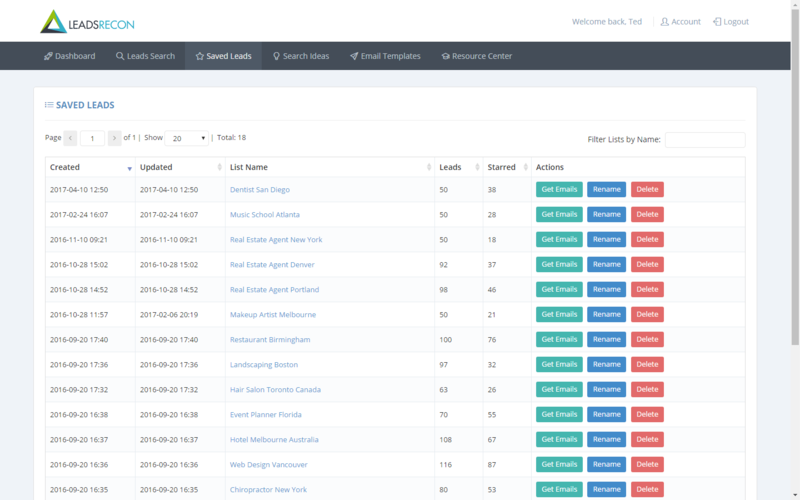 This is the dashboard of LeadsRecon. 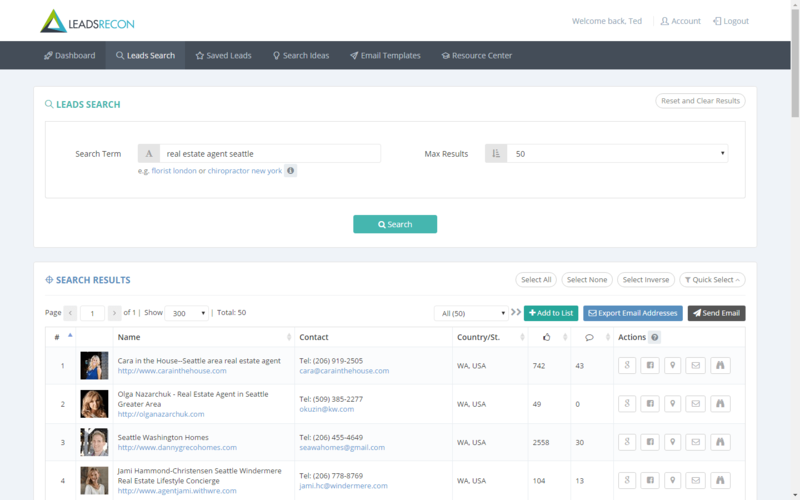 An example search for "real estate agent seattle". 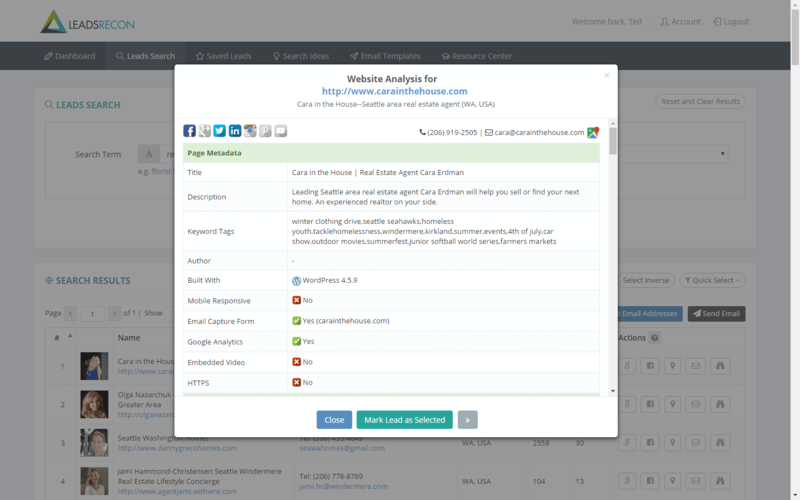 Analyze a lead's website, social media presence and areas for improvement with one simple click. 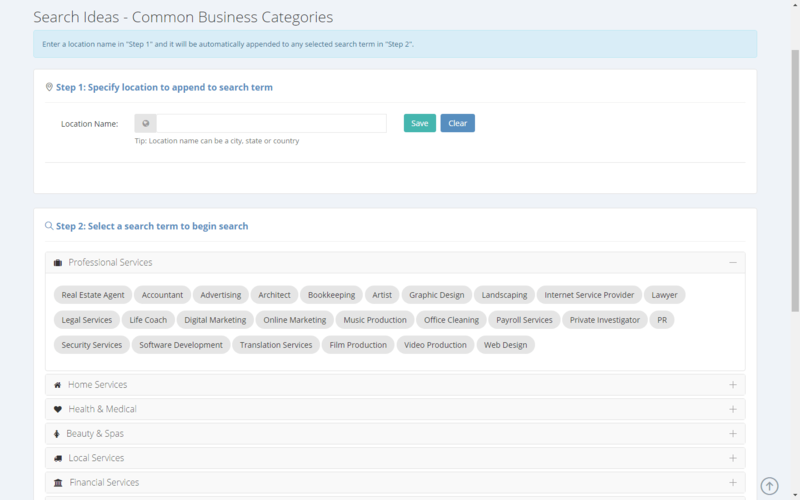 LeadsRecon even comes with hundreds of search ideas included so you can get started immediately. Easily save leads from search results to lists and access them anywhere, from any device. Easily send email to leads by selecting an email template that you have pre-written. Get clients chasing you down and paying you for your services. With LeadsRecon, you'll never worry about running out of leads. 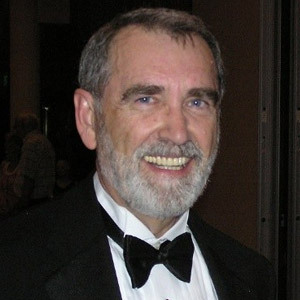 With LeadsRecon in your toolbox, you will become a 'lead magician' – able to do what your competitors could not: get targeted, high-potential leads on demand in any city, state or country in the world within seconds. It all starts with a lead. From there, you can convert a lead into a paying customer. Or an affiliate sale, or anything else. Simply put, more leads means more money. LeadsRecon gives you virtually unlimited leads instantly. Your LeadsRecon account will be created and be ready for use immediately after the transaction. LeadsRecon is a cloud-based software that works on Windows PCs, Macs and even tablets/mobile devices. It's time to up your game with LeadsRecon and take it to the next level. Does LeadsRecon work on my PC/Mac? LeadsRecon is completely web-based and works directly on your PC, Mac, tablets and even mobile devices without any software installation required. Are there any additional offers or upsells? No, there are absolutely no add-ons or upsells because you will gain access to the full feature set and all integrated tools of LeadsRecon upon signing up as a member. There are also no additional charges or setup fees. Does it work for the country/city I am in? Yes, LeadsRecon lets you discover local business leads that are located in any country or city around the world, no matter where you are currently residing. Are there limits on the number of searches? No, there are absolutely no limits on the number of searches. 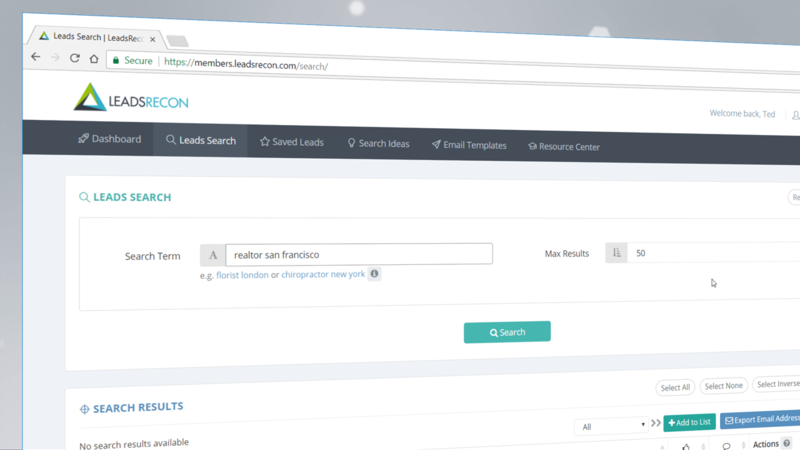 Your LeadsRecon membership comes with an unlimited number of searches. Are future software updates included? Yes, all future software updates and releases for LeadsRecon will be automatically made available to all members completely free of charge. Am I protected with a money-back guarantee? Absolutely. Test drive LeadsRecon for 30 days and if you are not completely satisfied after giving it a fair try, reach out to us and we will provide you with a full refund. As with all our products, we take customer satisfaction and happiness very seriously. Does it support non-English search? Yes, LeadsRecon fully supports searching in any language so you can uncover the most relevant and targeted leads in any city, state or country around the world. Are there limits on how many leads I can contact? No, there are no limits on the number of leads you can contact. LeadsRecon also lets you send emails from your own email account which means it's absolutely free to contact leads. 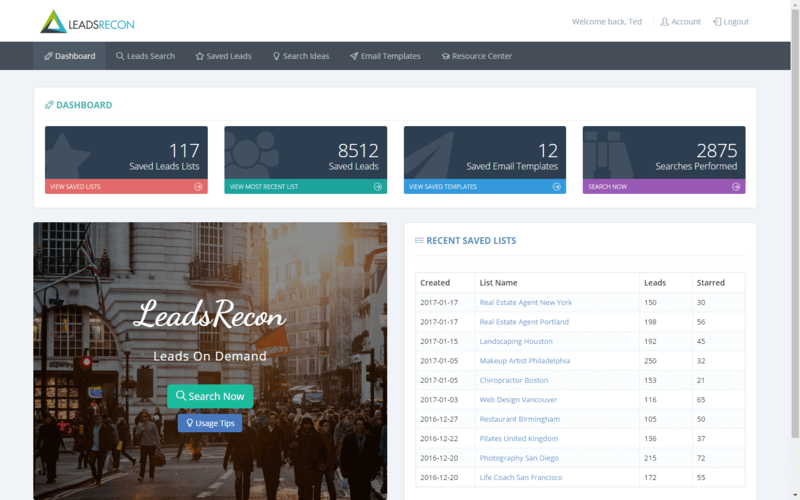 LeadsRecon packs a punch under its deceptively simple & clean interface. LeadsRecon is completely cloud-based and works directly on your PC or Mac without any cumbersome installation or manual updates. Tap into the ever-growing source of over 50 million active businesses and uncover higly relevant leads in any niche within seconds. Discover 1000's of leads anywhere in the world simply by appending the name of a country, city or even district to your search term. Analyze a lead's website and retrieve all the valuable information in one click without having to browse through an entire website manually. Easily save leads to lists, build up large lists of potential leads, add personal notes to individual leads, all from within LeadsRecon. 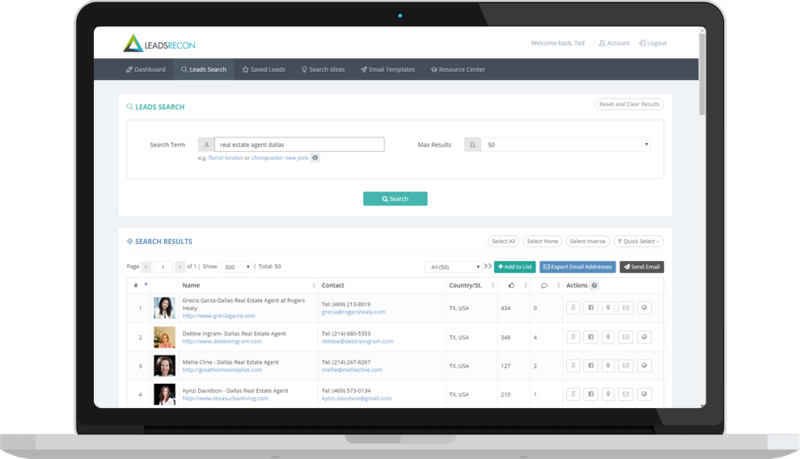 LeadsRecon comes integrated with a resource center packed with tips, tutorials and search ideas so you can get the best out of this tool. 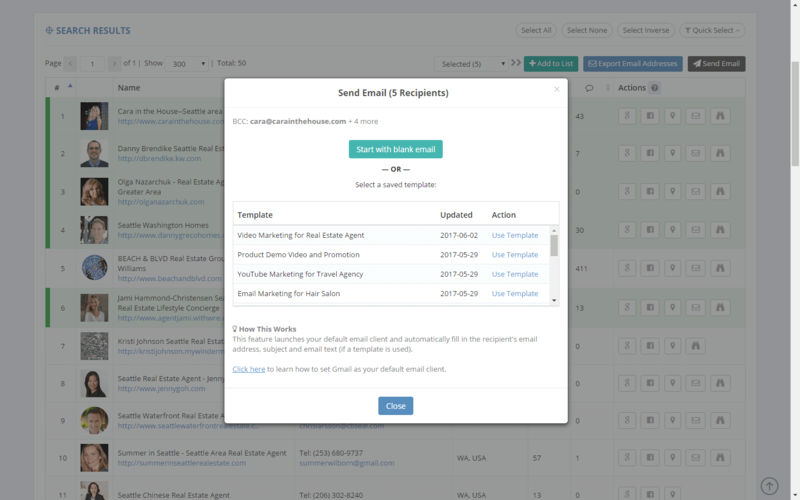 Select a lead, choose a saved email template and LeadsRecon automatically creates a pre-written draft for your review before sending. Easily export and save the email addresses of potential leads from your search results or saved lists to your computer or other software tools. LeadsRecon works perfectly on your mobile devices so you can access your saved leads and even search for fresh leads on the go. Copyright © Tedphoria Group Pte. Ltd. All Rights Reserved. LeadsRecon is not affiliated with any search engines, business directories or social networks.